One of the attractions at OzCon earlier this month was a showing of James Ortiz’s The Woodsman, produced in New York in 2015. It was a striking piece of theater stylishly adapted from L. Frank Baum’s story of the Tin Woodman. Another attraction was a preview of R. F. Wohl’s performance as Baum. He was workshopping a new one-person show with an audience of knowledgable Oz fans. Afterwards I heard an attendee note that Baum consistently referred to his tin creation as a “Woodman,” not a “Woodsman”—though many people (not just James Ortiz’s play) now use the longer word. That prompted some musing that perhaps one form had become more popular than the other, so I turned to the Google Books Ngram Viewer. 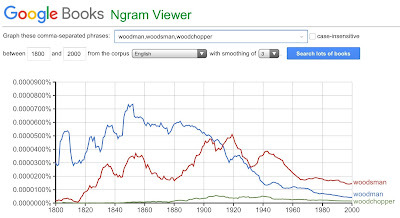 I asked it to graph out the popularity of “woodman,” “woodsman,” and “woodchopper” from 1800 to 2000. I restricted the query to lowercase only, eliminating “Woodman” as a proper name (and almost all mentions of the Tin Woodman as well). 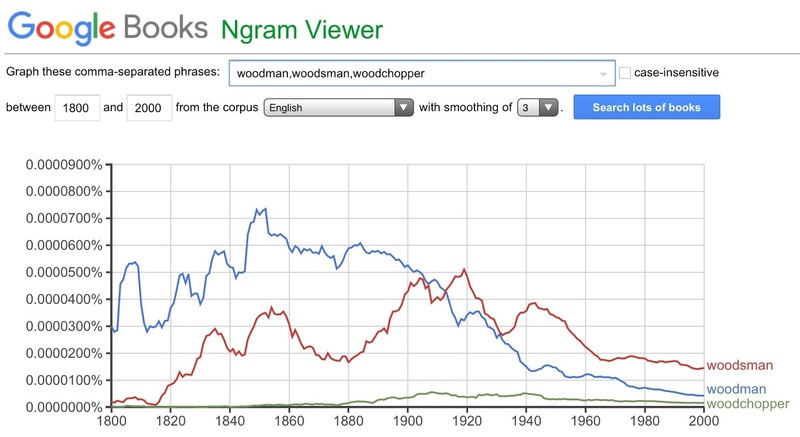 As you can see, “woodman” was the more popular word when Baum grew up and when he published The Wonderful Wizard of Oz in 1900. “Woodsman” rose suddenly in popularity starting in 1880 and around 1910 surpassed the shorter form. Both forms have been declining in print use since 1940 as we’ve moved away from a wood-based economy. You don't seem to address the difference in the two professions, Woodman vs. Woodsman, though I'm not sure how well you could specify that in the search. But the word usage rates are clearly dependent on such, IMHO. A woodman chopped and/or delivered firewood (like the Iceman or Milkman or Postman. A "Woodsman" is a forest ranger, naturalist, etc., that specializes in knowing about "the woods" and the failure to realize this difference in professions is what galls some of us - not the slight change to the spelling. Nick Chopper is a lumberjack not a forest ranger.